Back in the 1980s, during my pre-teen-to-early-teen years in the pre-Internet era, I was living in the New York metro area. I didn’t have a television in my bedroom, but I had a boom box! And I used it. One day, I hit the dial on my radio and accidentally found a Christian radio station that was right next to one of the most popular rock-n-roll stations of that time. That station was part of Family Radio — WFME. The music was almost intolerable to my young ears, but the teaching fascinated me… and it created a hunger in me to find out more about protestant Christianity. Late at night, when I was supposed to be asleep, I’d tune in to Harold Camping’s Open Forum program. I never called, but I always listened. I can still remember the theme music and his deep, authoritative voice. Most of the questions he fielded back then had to do with charismatic issues (which he was against), salvation issues (he did not believe that anyone could really have assurance of salvation), or end times issues (but at that point, he wasn’t pushing a particular date). I was impressed by his knowledge of the Bible and his total commitment to inerrancy. I can still hear some of his “taglines” rolling around in my brain… things like “The Bible is its own interpreter” and “The Bible alone, and in its entirety, is the Word of God.” I was young and impressionable… but those weren’t such bad impressions to be left with! I even wrote letters to Family Radio back then. The responses I received were (obviously) form letters, but I was honored to get any direct communication from them at all. I understood that Camping was extremely conservative and in a minority within the Church at large (and at that point, he was still attending a church), and even after I quit listening to him, I still remembered him with respect. By the early 90s, I was in NYC and part of the charismatic/Pentecostal “renewal movement,” so I missed the whole 1994 end time prediction. And even tho those early days listening to the radio had an impact on my life, I really didn’t think about Harold Camping or Family Radio much after that, even after I left the charismatic/Pentecostal movement. Then the May 21st thing came up. It’s disturbing enough when folks make predictions and admit that they’re not 100% certain… but it seems like you’d have to have quite an ego to make predictions and proclaim that the Bible guarantees it! It was hard to believe that someone whom I remembered as so conservative and so hesitant to accept anything that wasn’t clearly in Scripture could wind up going off into tangential numerical stuff like that. The Family Radio website has been unreachable most of the day, but I managed to get to one of their audio archive pages and started listening to some Open Forum recordings from earlier this week. Camping’s voice has changed… he sounds older, more tired, more extreme, and far less patient than I remember him. Or maybe maybe we just always look favorably on the memories of our youth. 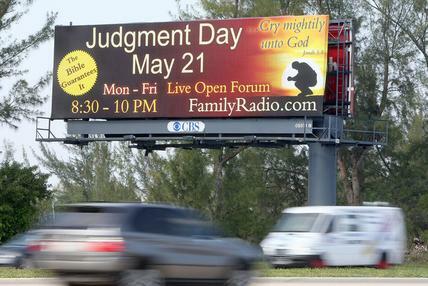 As May 21 draws to a close without the major earthquakes, without the rapture, and without any visible indication of the Judgment Day that he so confidently proclaimed… I can’t help but feel sorry for Harold Camping and his followers. I don’t even want to think about what these folks might do next. Will there be a revised prediction? Will there be suicides? What will happen to the faith of his followers? What will become of the newly disillusioned? But I was “newly disillusioned” once too… and painful as it was, God used that experience in my life. So I can only hope that their disappointment won’t drive them away from God, but humble them and give them a desire to go “back to basics” – not afraid to question what was God’s Word and what was merely a man’s. You’ve had quite a road to walk. It is interesting, however, how the Lord caught your attention through a gentleman who over time has left much to be desired. Copyright © 2009 Recovering Pentecostal. All Rights Reserved.